The financial industry "Numbers", using digital to see the essence of listed companies, using digital to measure the Chinese capital market. The decline in iPhone sales has finally set off a global wave. Most importantly, after the performance is expected to fall, Apple lost the equivalent of one quarter of its iPhone sales overnight. Apple has "evaporated" nearly 500 million iPhones in the past three months. For the first time in 16 years, the company's performance forecast was lowered. The stock price hit the biggest one-day drop in six years. Apple's performance "Thunderstorm" shocked the world, followed by a series of amazing data. On January 2, Apple CEO Tim Cook issued a letter to investors, saying that due to unexpected market slowdown in China and other markets, it is estimated that the first quarter of 2019 revenue will be 84 billion US dollars, after the guidance of 89 billion - 93 billion US dollar; cut gross margin to 38%, which is the lower limit of the guidance range. After the US stock market opened overnight, Apple's share price once fell more than 8%, and then the decline quickly expanded. At the close, Apple fell 9.96%, the biggest one-day drop in six years. Overnight, Apple's market value evaporated by 74.6 billion US dollars (over RMB 500 billion). Since the stock price hit a new 52-week high of $233.47 on October 3, 2018, Apple's share price has fallen by nearly 40%. A month ago, it was the largest listed company in the United States. Today, Apple has given the US stock market three-tier success to Microsoft, Amazon, and Google's parent company Alphabet. 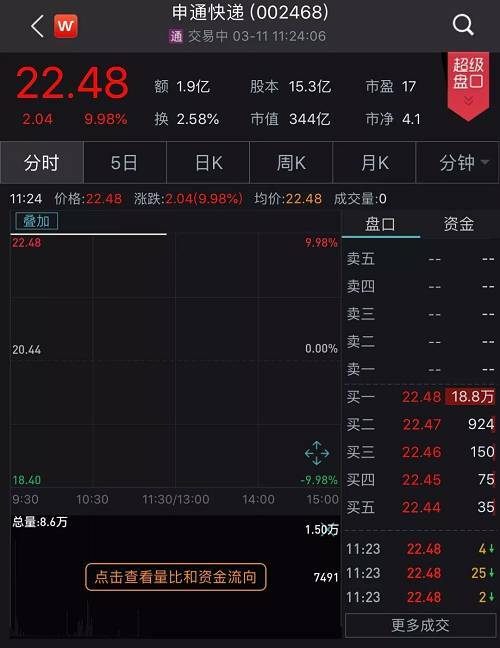 After the opening of Asian stock markets in Beijing time on Thursday, the stock prices of China’s A-share and Hong Kong stock-related Apple-related industrial chain companies plummeted.Dongshan PrecisionWhen more than one A-share market fell, Hong Kong stocks AAC Technologies and Sunny Optical Technology fell more than 5% and 6% respectively. CICC said that Apple's revised income guidance may have a certain impact on the fourth-quarter performance of China's mobile phone component manufacturers, which account for a relatively large proportion of Apple's revenue, including: AAC Technologies,Lixun Precision,Lansi Technology,Goer shares,Xinwei CommunicationHong Teng,Desai battery,Industrial rich unionWaiting; be wary of the possibility that the entire mobile phone industry chain annual earnings will be significantly revised down, and remain cautious about the industry. Apple's market value has evaporated by about $446 billion in more than three months. The market value of shrinking is higher than any of the 496 S&P constituents, including Facebook and JPMorgan Chase. Only Microsoft, Amazon, and Google's parent company Alphabet are the exception. In addition, the market value lost by Apple far exceeds Alibaba's market value of more than 100 million US dollars, which is more than twice that of Buffett's other "love" Wells Fargo, more than three times that of McDonald's, and more than five times that of retail giant Costco. It is more than 10 times that of the US arms giant Raytheon. 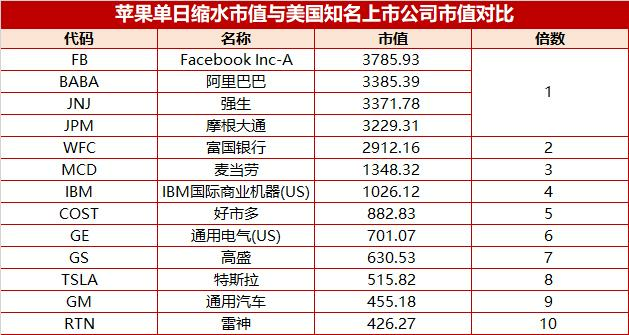 According to the latest published Forbes China data, Apple's market value in 3 months has fallen more than 12 times the value of Chinese rich people such as Xu Jiayin, Ma Yun and Ma Huateng. The Apple plunge is also a big drop for Buffett, who hates technology stocks but only "likes" Apple stocks. According to Berkshire, as of the end of the third quarter of 2018, a total of approximately 252.5 million shares of Apple stock were held, and Apple was its largest position, accounting for 21% of the portfolio. If it is estimated at the end of the third quarter, when Apple's stock price fell to its lowest point in intraday trading, Berkshire's position evaporated nearly $4 billion in less than a day. On February 1, 2017, Apple's share price was about $129. Berkshire has significantly increased its shareholding in the past two years at a much higher price. At the end of 2017, Berkshire had held 165.3 million shares of Apple. At that time, Buffett told CNBC that he obviously liked Apple. "We buy apples for holding." Data shows that Berkshire Hathaway's Class A stock (East Time) fell more than $15,000 on the 3rd, a drop of 4.93%, the largest since the VIX index termination on February 5. A single day decline. If you do not consider the one-off decline that was quickly reversed on February 5, this plunge is the biggest decline since the US credit rating was lowered in August 2011. What's more, Apple's nearly $75 billion market value lost overnight is calculated based on the price of its three new models, worth more than 50 million iPhone XS (Max) and nearly 80 million iPhone XR. The sales of these three iPhones fell short of expectations, prompting Apple to cut its performance expectations. According to the three quarterly report released by Apple in November last year, it sold a total of 46.9 million iPhones in the third quarter. The market value has shrunk by about 1-2 quarters of iPhone sales, and according to its market value shrinkage in the past three months, Apple Need to sell another 3-5 billion new iPhones to make up for the loss. Apple CEO Cook said in a letter to investors that the company mistakenly underestimated the extent of the slowdown in some core emerging markets, especially the slowdown in demand for iPhones in Greater China, which together with the indifference of other emerging markets constitutes the company. The reason for the year-on-year decline in sales revenue of mobile phone products. Citigroup expects Apple's iPhone shipments in the first quarter of this year to be 45 million units, a 10% decrease from the previous forecast of 50 million units, of which iPhone Max XS sales will be reduced by 48%. US investment bank Cowen's iPhone shipments in the first quarter are roughly in line with Citi's forecast, and it is expected that iPhone shipments will be less than 200 million units in 2019, down 7%-10% year-on-year. Under the expectation of weak iPhone sales, Apple also announced that it will not disclose the sales of core products such as iPhone, but only disclose the total revenue of each type of products. "New debt king" - DoubleLine Capital CEO Jeffrey Gundlach commented that Apple unexpectedly lowered the guidance on revenue, "it is exactly what happens in a bear market." He believes that US stocks have really entered a bear market. Apple Futures will invest in 2018. Multi-species agricultural products still have investment opportunities. Afternoon comment: Shanghai stock index returns to 3000 points, the GEM is up nearly 3%, and the concept of the Internet of Things is rising. The market has experienced a big downturn: the buyer’s seller has quarreled. How do you do this week? A-shares ushered in an intensive holding period. Several companies disclosed shareholder reduction plans. Anxin Computer: Edge calculations are positive. Four levels of recommendation are recommended.